During the last school holidays, my daughter's classmates came over to my house as to do a school project together. I baked their favourite's pizza and cup cakes. 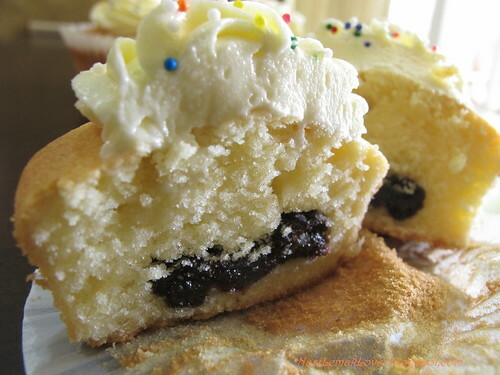 -I add prune (ready pack from Sunsweet brand) in this cup cake, I learnt from Sulianmama here. 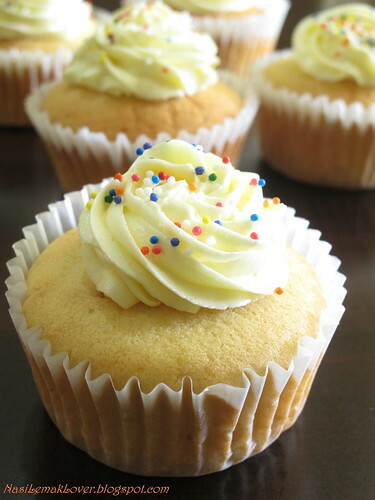 This cup cake is a bit sweet for my taste, but kids enjoy this very much especially the buttercream..
3. Add in egg one at a time, then add in vanilla essence, mixing well. 5. Pour ¼ mixture into a paper cup, place a piece of prune. Then pour the remaining 2/4 mixture. 6. Bake in pre-heated oven at 180C for 20mins. 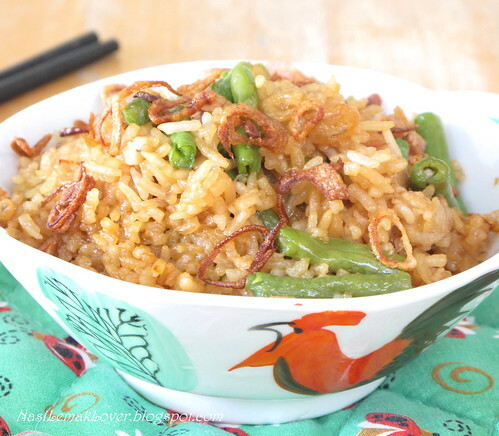 Almost every Chinese family also know how to cook this long bean rice especially Hokkian people like me, I like to cook this one dish meal during weekend, quick,easy and tasty ! 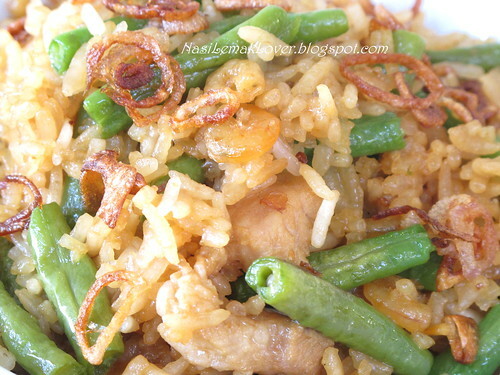 -Rice toss well with all ingredients and seasonings, before add water in rice cooker..
1. Heat some oil in a wok, saute shallot until crispy and golden brown, set aside. 2. Use the remaining oil, add in pork belly, sauté till slightly brown. 3. 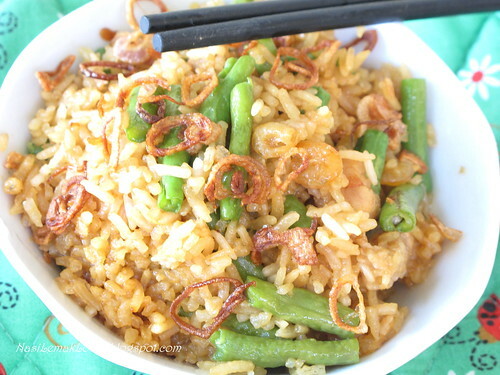 Add dried shrimp, stir fry till fragrant, then add chopped garlic and long bean, mix well. 4. Add in rice and toss well, add in the seasonings. 5. 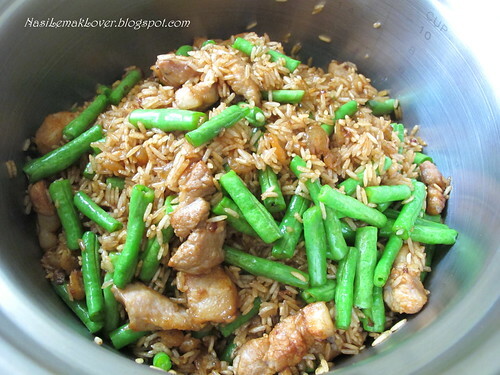 Remove the long bean rice and transfer to a rice cooker. 6. Add water and cook the rice. 7. 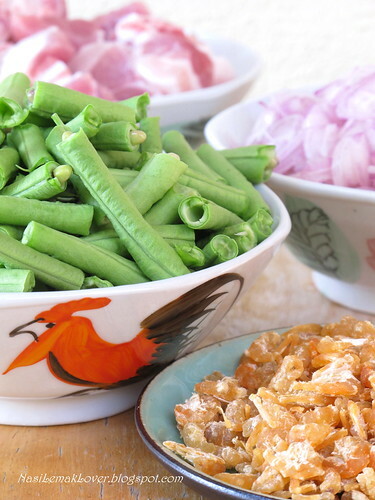 Garnish cooked long bean rice with fried shallots, serve hot. 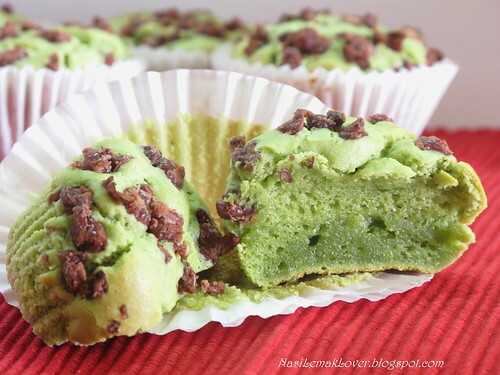 Matcha and Red Bean Mochi Cake, full of surprise !! 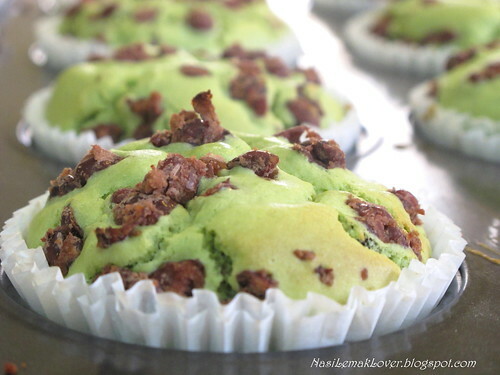 When I first see this mochi cake, I tell myself i must try this cake immediately. 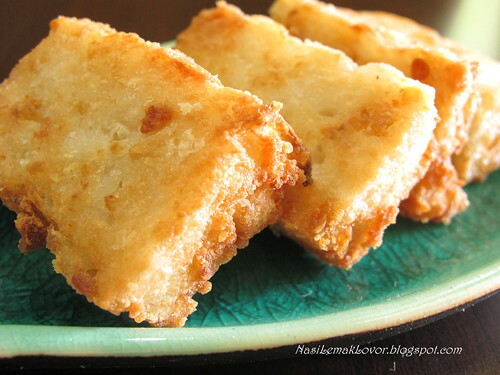 Because I can not imagine a cake with crunchy outside and chewy inside, like you eating a mochi (Mochi is a sweet glutinous rice snack in Asia) or Nian Gao.. Something new to me!! 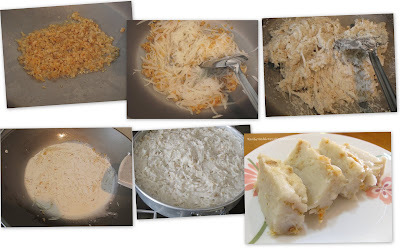 On our 1st trial, my family immediate fall in love with this mochi cake, the taste was so so good..even my husband seldom eat cakes, also gave thumbs up. 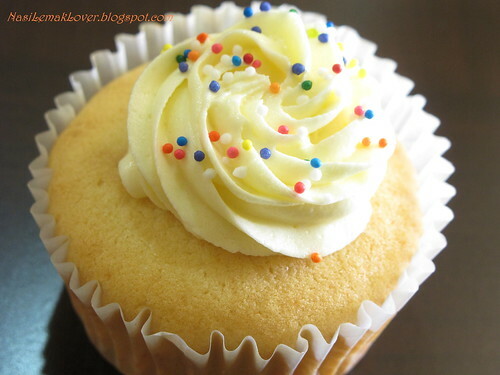 -There is not much difference in colour before baking and after baking, look so beautiful. 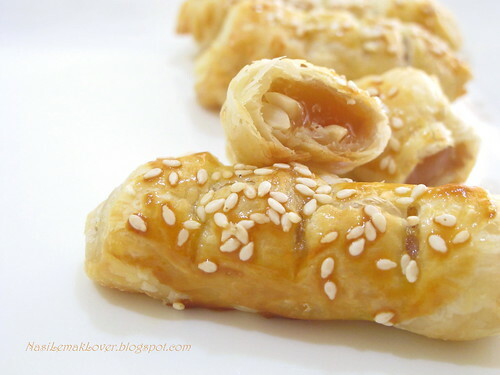 Recipe was adapted from My buttery fingers, a 17 years old girl talented in baking !! 1. 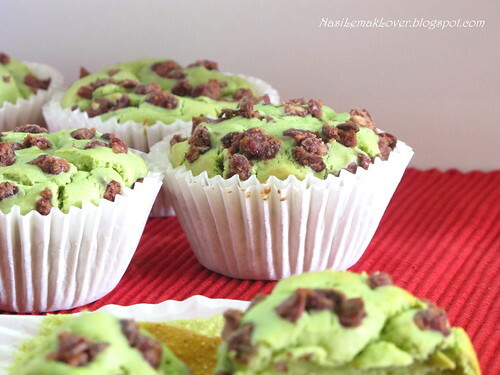 Sift glutinous rice flour, matcha powder and baking powder together. 2. Beat eggs and sugar until fluffy. 3. Add in melted butter, then evaporated milk, mix well. 4. Add in flour mixture, combine well. 5. 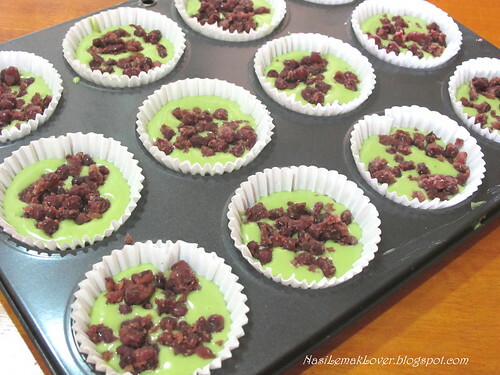 Place paper cups on a muffin pan, scoop batter and place 1-2tsp cooked red bean in each paper cup. 6. Bake at pre-heated oven at 180c for 20-25mins. -this mochi cake tasted crunchy & chewy when still warm, but turn moist when cold, anyway both ways also tasted good!! 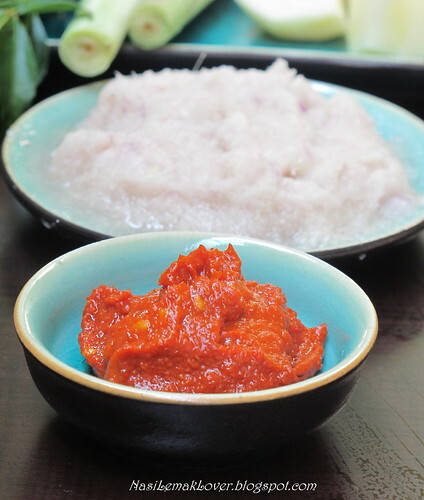 -You can cook red bean by adding 100g red bean,4tbsp sugar with 800ml water, cook for 1hour or until soft and dry. 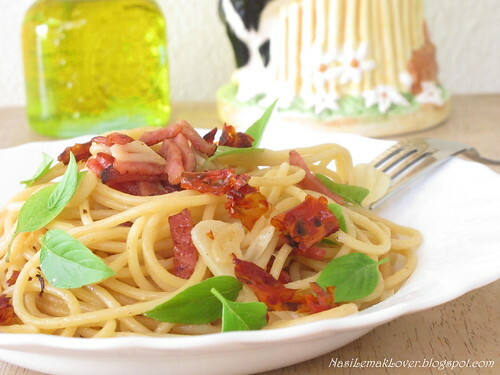 Spaghetti Aglio Olio is one of the pasta that I like the most, just with these simple ingredients-Olive Oil, Garlic and Basil leaves, easy, fast and good. 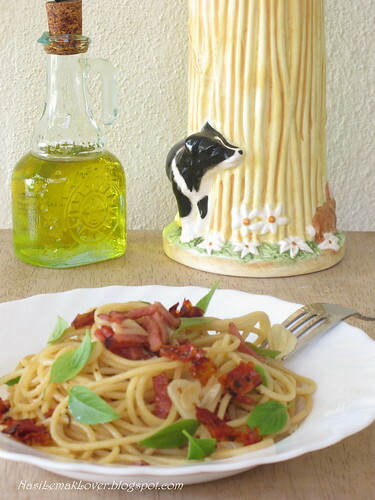 -These are my favourite holders to store Spaghetti ingredients, Spaghetti Holder ( see the cute rabbit and dog !!) 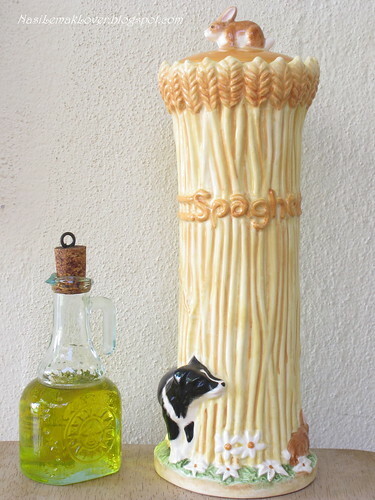 and Olive oil glass bottle. 1. 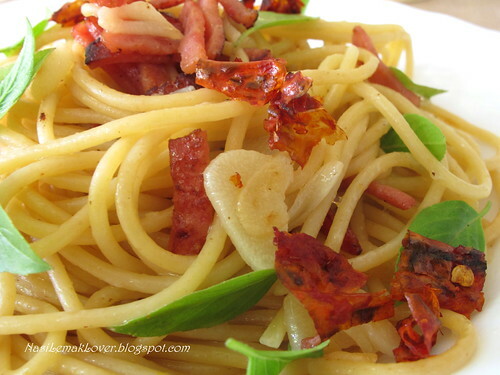 Pan fried ham with olive oil, add light soy sauce, stir fry till fragrant, set aside. 2. In another clean pan, add olive oil, garlic and dried chillies, stir fry till aroma. 3. Add in cooked Spaghetti and stir well. If the mixture is too dry, add some water. 4. Add in seasoning and fried ham, dish out and serve hot. Yes, is true..I don't know why somehow pancake never listed in my baking list before...even I have done so many type of baking.. 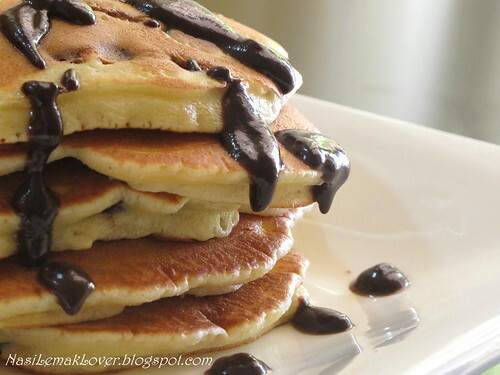 Recipe adapted from ReeseKitchen, but I replaced cheese with chocolate chips and prepare some chocolate sauce as my family are chocolate lover. 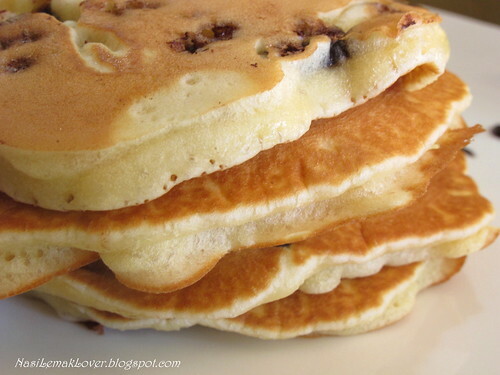 This pancake recipe is good, the texture is just nice and perfect. Thanks Reese for kind sharing !! Pancake Method:1. 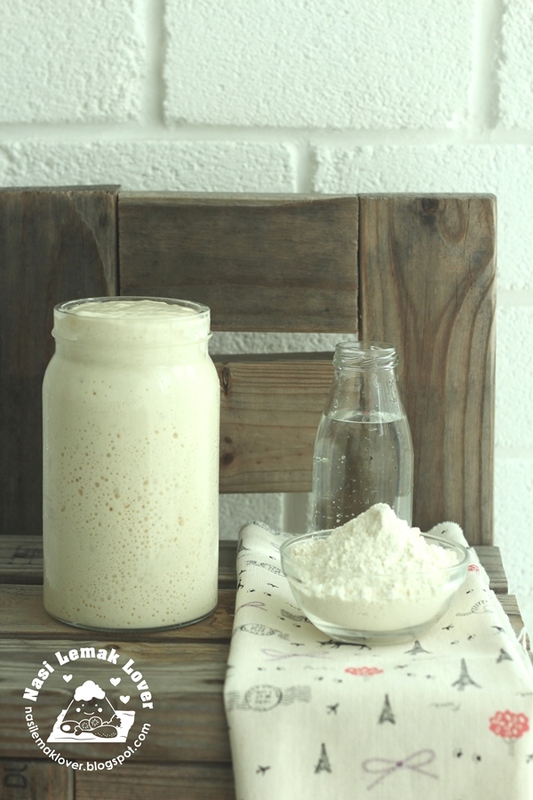 Mix flour, sugar and salt in a mixing bowl. 2. 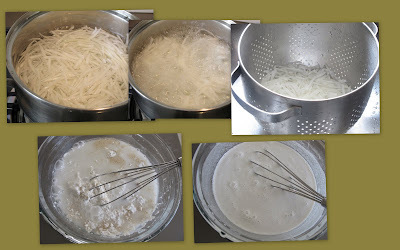 Add in egg yolks, milk and corn oil, use a hand whisk to stir well. 3. 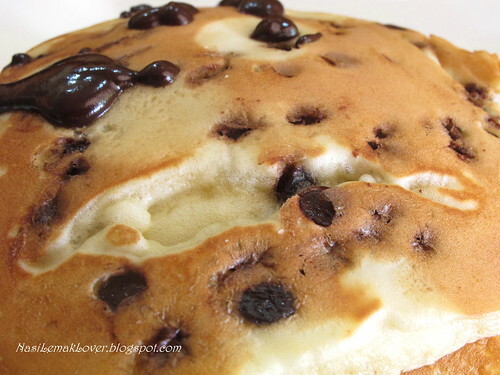 Add in egg white and stir to combine, then add in chocolate chips, lightly mix well. 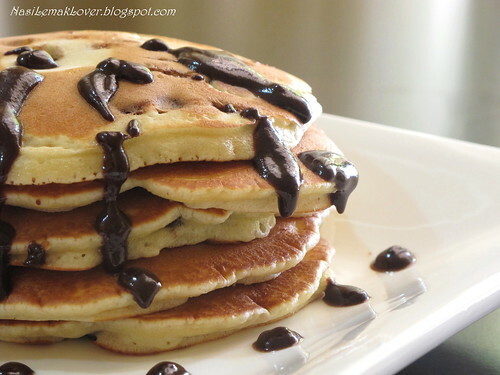 Chocolate sauce- Melted 30g dark chocolate over double-boiler, and add 2tbsp of heavy cream and mix well, set aside. 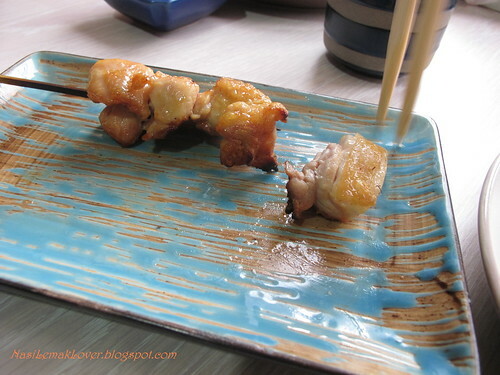 I choose to had my Birthday dinner at Sumi-ka Japanese grilled House at Subang Jaya, specializing in Yakitori (Japanese style grilled chicken skewer)owned by a Japanese. 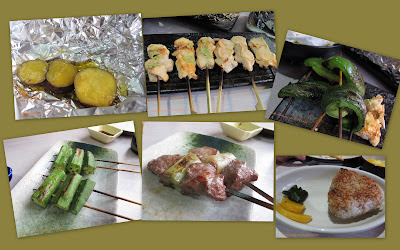 Their Yakitori are so fresh and yummy, I will visit this restaurant again and again since my family love Japanese foods. -Just a simple fresh cabbage and soy sauce, also taste fresh, sweet and good..
-Reasonable price, but they only accept CASH !! 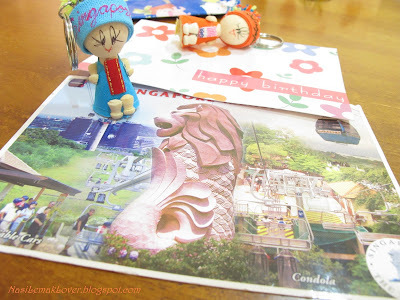 - A postcard, Birthday card and two cute key chains from Somewhere in Singapore. She is so nice sent me a postcard after i left my comment in her blog saying I have never received a postcard ! 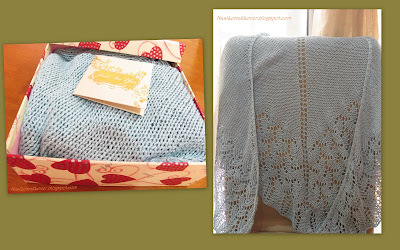 Thanks to Sharon..
-My sister-in-law Annie specially knitted a shawl for me, this shawl is so beautiful. Thanks Annie. 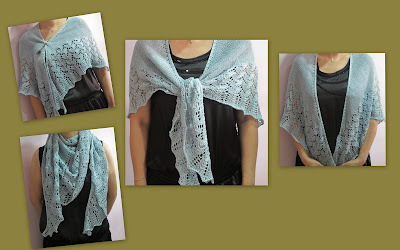 -I show you few ways how to wear a shawl, you may check her lovely blog-My Knitting Gallery. 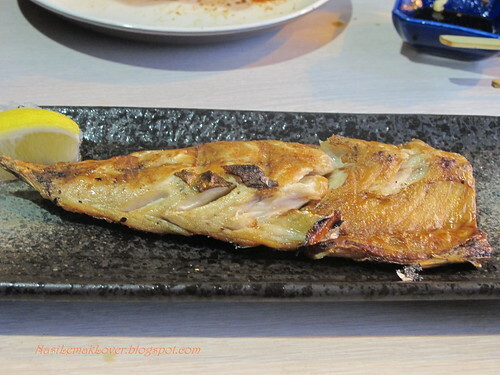 When the lazy bugs attacked me during weekend, usually I will cook one dish meal for my family. Easier, faster and delicious. 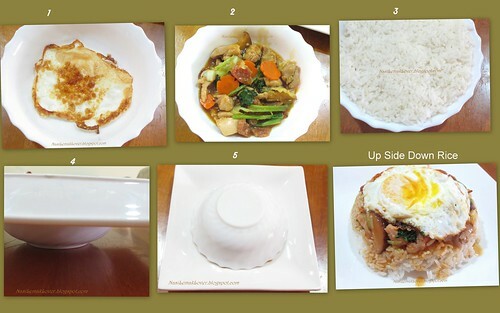 Why not you give it a try of this "Upside Down Rice" in this weekend? 1. Heat oil in a wok and fry garlic until lightly golden. 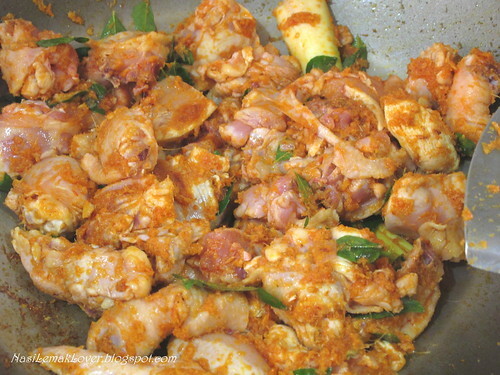 Add chicken meat and fry till colour changed. 3. Pour in some water and cook over medium flame. 4. Add seasoning to taste, then dish out. 1. 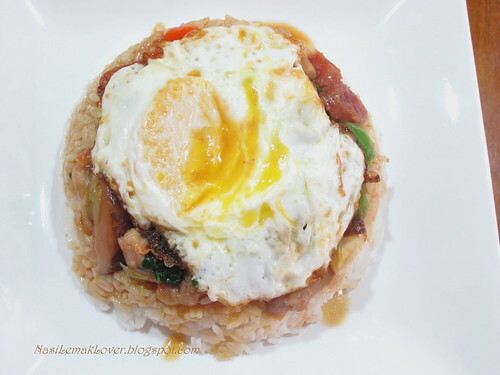 Place one fried egg on a rice bowl. My note: You may replace any type of vegetables which are available in your fridge. 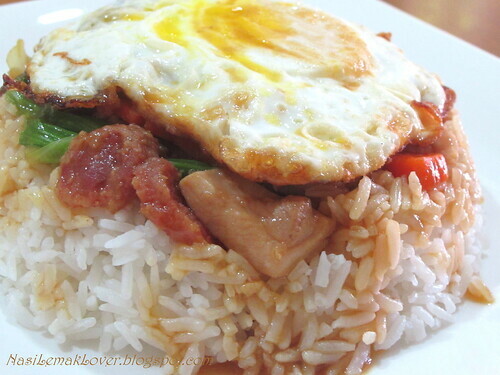 Try not to over cooked the fried egg, when the runny egg yolk mixed with rice, they are just perfect and delicious. 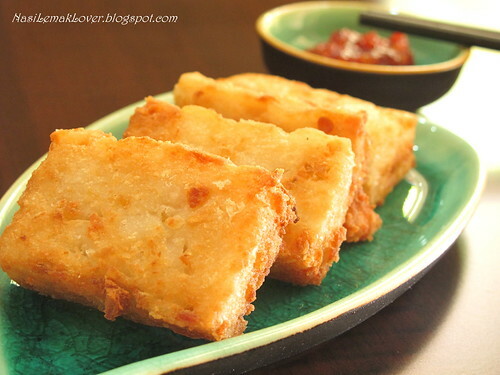 There are many ways of eating Nian Gao (check my homemade Nian Gao here), for me, usually I just wrap it with spring roll skin and pan fry or fry with sweet potato and yam. 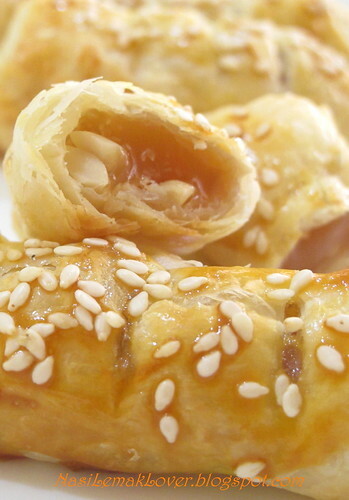 Recently I learnt a new way to enjoy Nian Gao (from a TV cooking show), something new and tasted not bad wor..
-Place Nian Gao on the puff pastry and sprinkle some peanuts on top..
My note-This time, I share with you the ingredients and method only, as I did not record down the actual weight of Nian Gao and Puff Pastry, it depend how many Nian Gao you have, then you adjust the pastry and other ingredients accordingly. 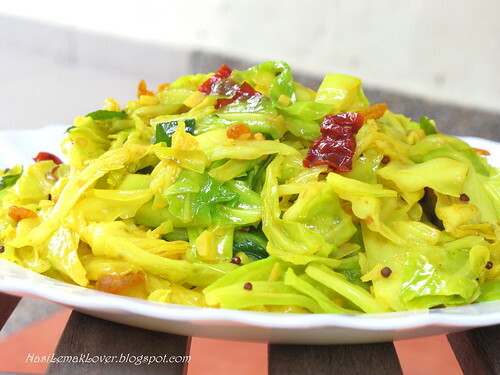 When I cook curry, usually I like to stir fry some Indian style of cabbage to accompany with curry. 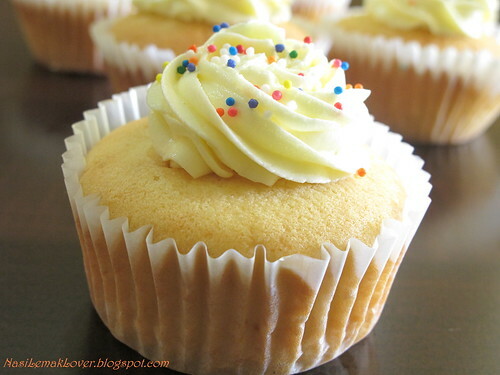 Simply easy and yummy !! 1. Heat oil in a wok, add in dried prawns, stir fry till aromatic. 3. 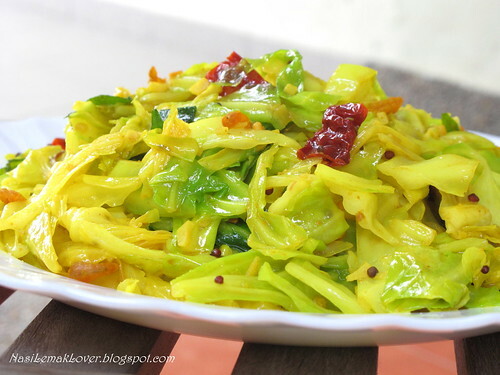 Add in cabbage, mix well and season with turmeric and salt. You may add a little water to moisten the vegetables. Cook until veggie is done (about 2-3mins). 4. 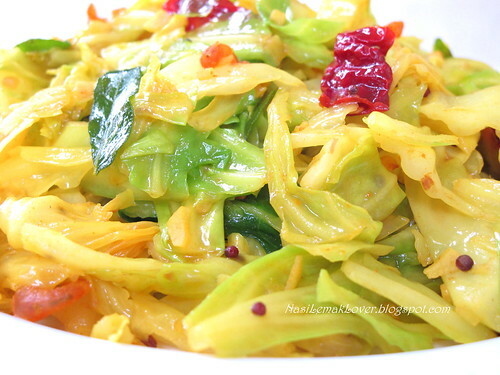 Serve with rice and curry. 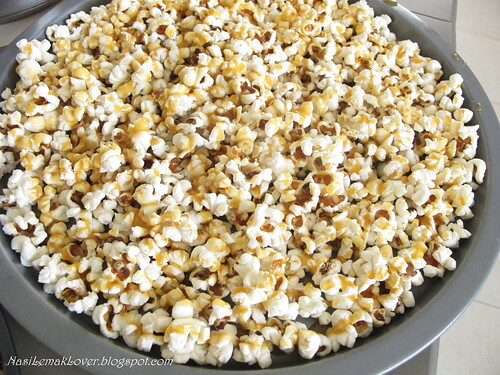 - Since this is my 1st time pop the corn kernels (only a small bunch), my kids and I shouted and overwhelmed when I opened the lid and we see popcorns all over the whole wok...Just amazing!! 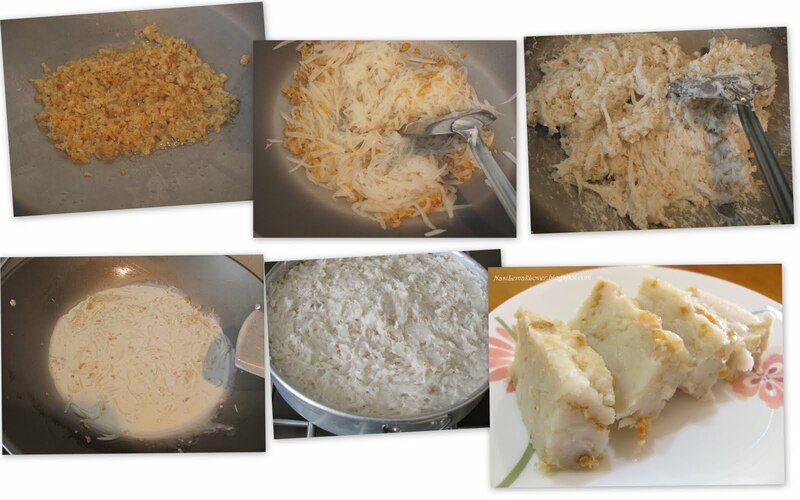 Recipe adapted from Ohbin, Thanks to Ohbin for kind sharing of this great recipe. 1. Pour corn oil into a wok/pan, coat entirely the wok. 4. Cover the wok, slowly move the pan to keep the popcorn from burning in spots. 5. When the popping slows down to the point that you don’t hear much pop, off the flame. 6. 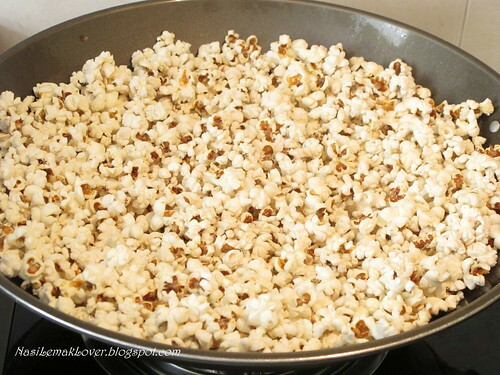 Take off the lid, and pour popcorn into large bowl., remove unpopped kernels. 7. 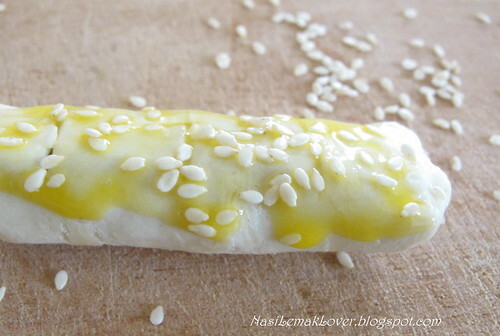 Spread onto the prepared baking sheet and set aside. 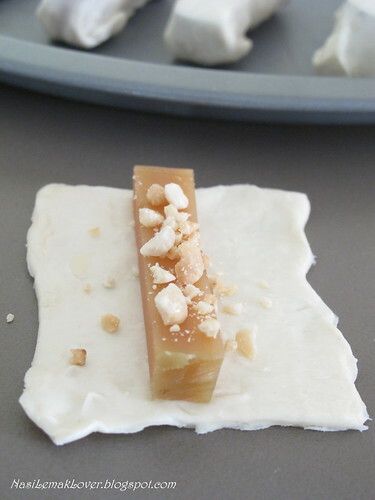 To make caramel popcorn1. 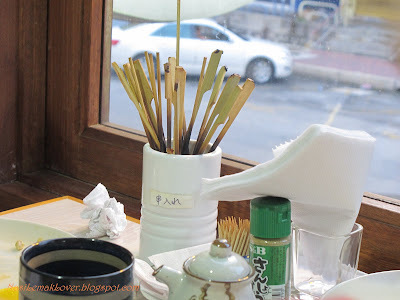 Add sugar in a clean wok/saucepan over medium flame, cook till melted and become syrup. 3. 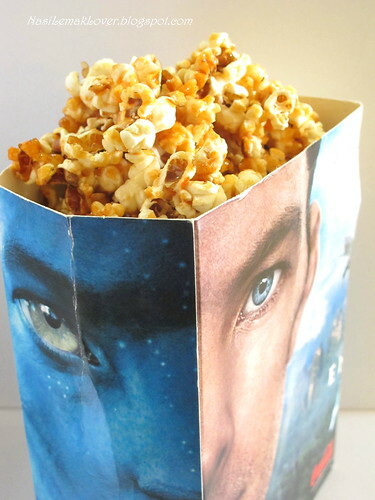 Let the syrup cool slightly, then drizzle over the popcorn. Toss the popcorn carefully using spoons. 4. Bake at preheated oven at 150c for 20-30mins, stir from time to time. 5. 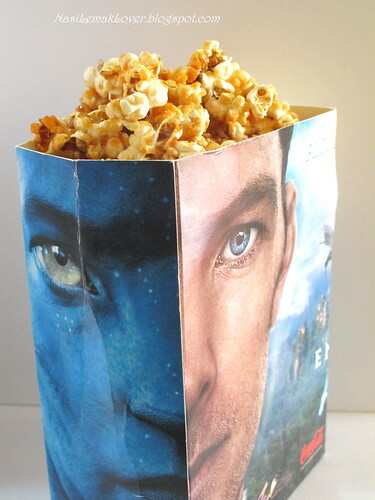 Store popcorn in airtight containers. 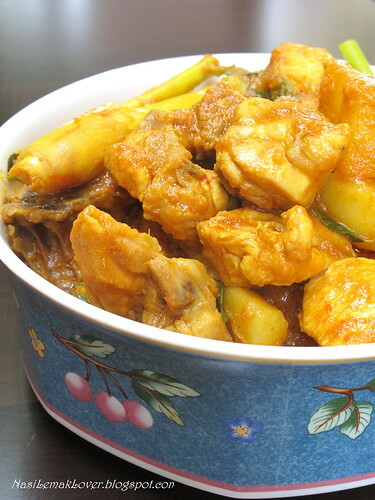 This is a typical Chinese style of Chicken Curry and this is the way how my mom used to cook. 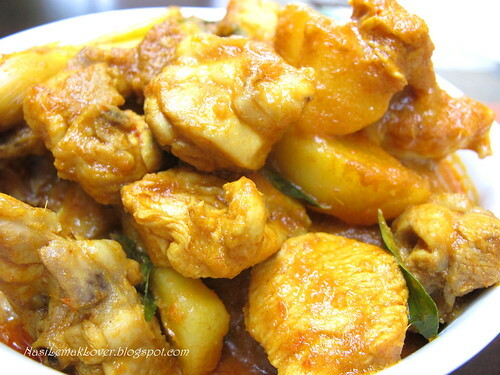 And we also like to serve this style Chicken curry in any kind of party e.g. 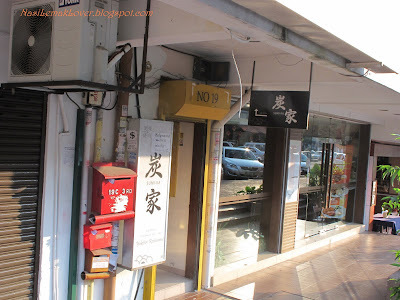 Birthday party, Baby full month party & etc and usually to eat together with fried mee hoon (rice vermicelli) or fried noodles. Chinese style of chicken curry is slightly difference from Indian style as we do not add so many kinds of spices like cinnamon, cumin, coriander & etc. 1. 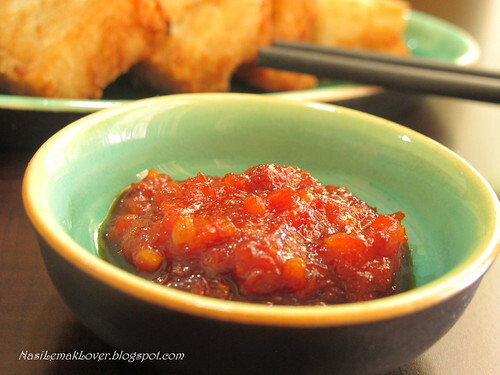 Heat oil in a wok, sauté the pound ingredients and chilli paste until fragrant. 2. Add in chicken pieces, lemongrass, curry leaves, stir fry for 1min. 3. Add in curry powder and turmeric powder, mix well. 4. Pour in water and bring to boil (2-3mins). 5. 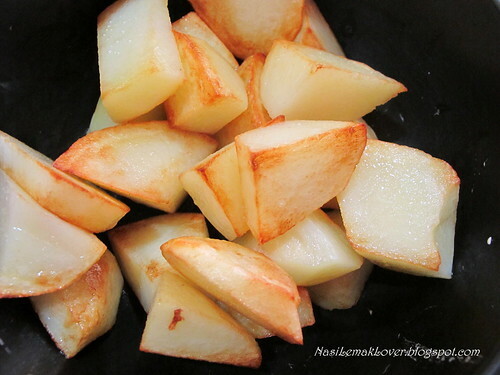 Mix in coconut milk and fried potatoes, and simmer till the chicken is cooked (about 15mins). 6. Add in salt and sugar, combine well. 7. 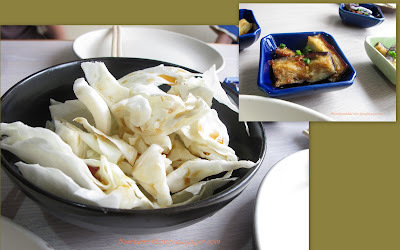 Dish out, serve with steamed rice. *my note-if you like to have more gravy in your chicken curry, then add more water and coconut milk..